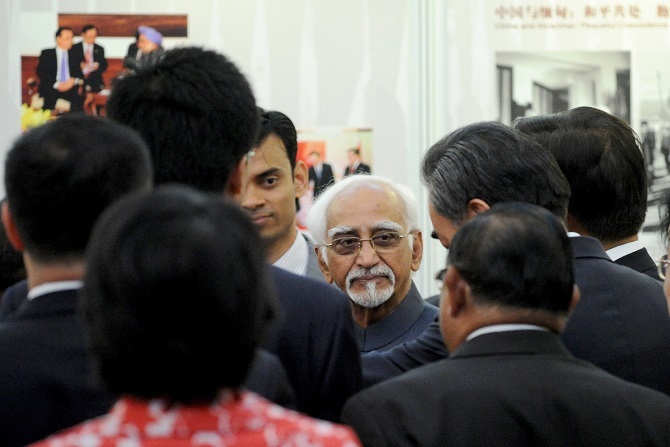 IMAGE: Then vice president Hamid Ansari visits a photo exhibition marking the 60th anniversary of the 'Five Principles of Peaceful Coexistence' in Beijing in 2014. 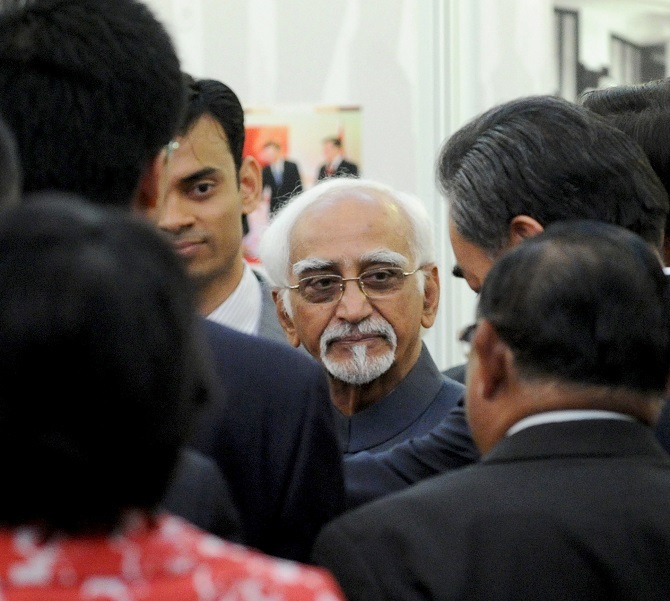 Before he became vice president, Hamid Ansari was India's ambassador to Afghanistan, Iran, Saudi Arabia and the United Arab Emirates; high commissioner to Australia; and India's permanent representative to the United Nations in New York. Experience that makes him perfectly suited to tackle questions on India's ability to tackle the Kashmir and China problems. In the concluding part of his exclusive interview with Karan Thapar, Ansari also discusses his future plans. You have been a very successful diplomat. You've been an ambassador or high commissioner to six countries, including the United Nations, before you became vice president. And it's in that light that I want to raise briefly, two issues of deep concern. The first is the situation in Jammu and Kashmir. Speaking in Bangalore you said, and I am quoting 'the political immobility in relation to Jammu and Kashmir is disconcerting'. Are you suggesting that the governments both in Srinagar and Delhi ought to be taking more initiatives and are not. Is that the immobility that you are talking about? Yes. Yes. The problem is and has always been primarily a political problem. And it has to be addressed politically. And politicians today are ducking it? That's my impression. And I'm not the only one in the country. So, when you look at the trajectory of developments from say the killing of Burhan Wani in July last year and the way things have escalated, are you worried about what is happening in Kashmir? Are you apprehensive that the situation may be passing beyond a point of control? Well, when young boys and girls come out on to the streets and throw stones day after day, week after week, month after month, it's something to worry about because they are our children, they are our citizens. Something is obviously going wrong. What exactly? I am not the final word on it, but I think there are enough people in the country who are worried about it. Eminent people belonging to different political persuasions and their worry must be taken on board. And in your speech when you said this immobility is disconcerting you were actually saying to those in authority, be they in Delhi and Srinagar, you got to respond and act. You can't not do so? Those are my words. I have expressed my worry in my own terms. Now whether someone reads it or not is not my business. The second issue that is problematic today is the India-China standoff at Doklam. The Chinese newspaper the Global Times quoted a Chinese expert who said that a small-scale military operation is possible, may be even likely, in two weeks. Speaking of the apprehension in India, are you apprehensive about this situation? Not really. I think we have had these periods of standoffs with China. And there is enough knowledge, enough experience, enough wisdom still available to be able to retrieve situations. This is a very interesting answer that you are giving because the point made repeatedly by the government or the MEA spokesperson is that the present standoff is not substantively different to those we have seen in the past. The Chinese, as you know, have vigorously and strenuously denied that. You are relatively sanguine about the handling of the situation. You are not worried even though many in the newspapers and television are beginning to express anxiety and fear. You don't fall into that category. The totality of Indian experience in dealing with China is very considerable, and makes me think that we will handle it. And you are confident or at least not apprehensive, at the moment, that we are handling it properly? No, I think that the government will manage it. My last question. What next? But have you any plans in mind? Have you decided how you will spend your years of freedom? Because uptil now job restraints, responsibilities and protocol have weighed down upon you. You will still not be a free man. You will still be surrounded by security. But have you any idea what you want to do? Do all the things that I wanted to do and have not been able to do in sufficient measure. Does that include writing your memoirs? So, the wonderful stories and anecdotes will remain a secret with you forever. Secrets will because I am bound by the Official Secrets Act. But what about the lovely stories and anecdotes? Would you be tempted if an intelligent publisher were to come knocking on your door to write them down? I don't think I have that many stories to tell. So, all you know you will keep to yourself. Maybe not. But they will not be put down in book form. But we can look forward to hearing you in more discussions like this one? You won't have the time, and I won't have the inclination. But for today, Mr Vice President, I am deeply grateful for the honour -- the pleasure of doing this wonderful interview. Thank you very much indeed. It's been great talking to you, Karan. All the best.